Two biggest iOS4 features for the iPhone 3G were Folders and Unified Inbox. There really wasn’t anything else significant from the upgrade. Folders made it hard to figure out where you put apps if you have a lot of them. And all that extra clicking to open a folder plus you had to close the folder once you exited the app made for extra work. All of a sudden flicking through many screens of apps didn’t seem so bad. Unified Inbox for the Mail app was great. No problems with that, but still not a deal breaker. Also my iPhone 3G ran slow on iOS4. Probably didn’t help that it’s jailbroken but still it was really running slow. And iOS4 broke some of my iTunes App store paid apps likeWiFi Analyzer. Here are the links on how to do it, follow at your own risk. If you’re a Mac user and have Time Machine running you’re in luck, you can find the old versions of your apps. If you’re not running Time Machine or are on Windows you may not be so lucky if you have no backups of the older apps. 2. Now press the Time Machine icon in your dock and go back in time to before you installed the iOS4 update. FYI, iOS4 was released on June 21 so if you can get to a Time Machine folder before that you’re good. 3. Click on the app you want, they have an .ipa extension, and choose restore. Repeat for any other apps. 5. IMPORTANT: You will now have at least two versions of the application in the folder Mobile Applications, the iOS3 version and the iOS4 version. Drag the iOS3 version of your app from this Folder into the Music library window of your iTunes app. It will ask if you want to replace the newer app, go for it. Now you can delete the newer app in your Mobile Applications folder. Repeat for other apps. 6. The rest is done in iTunes. Choose your iPhone in the left sidebar, go to the Apps tab, checkmark your app and sync it to your iPhone. 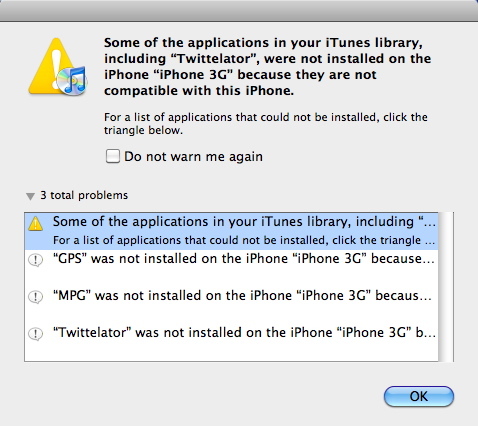 *note* After I restored the apps I still couldn’t sync them onto the iPhone, that’s when I figured-out step #5 above. Good luck! Here’s a video from cnet that has info on how to do the retrograde. You have to watch through a few other clips before the instructions.